With a title like this one, I had to pick it up. This is the second book that I've picked up on a whim lately. I didn't enjoy it as much as my first pick, but it wasn't half bad. I'm afraid that if I go forth and select another book blindly I'll ruin a decent streak, hate whatever the book is that I select next, and stay away from experimentation all together. But so far, decently good. Cornelia was neither fantastically amazing, nor was it absolutely horrid. I'm ambivalent towards it, which I know isn't what any author would want to hear but nevertheless, it is what I am. It is the story about a young girl, around the age of 11, who was raised by her single mother who is a famous world concert pianist. Cornelia is frequently left in the dust while her mother travels all over the world delighting listeners with her musical abilities while ignoring her daughter. Her mother, Lucy, loves Cornelia but fails when it comes to demonstrating the emotion. 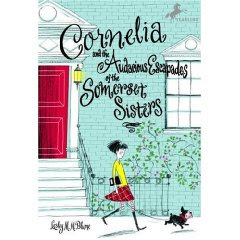 Cornelia is alone, lonely and searching for acceptance in the world until a new lady moves into the apartment next door and turns Cornelia's world upside down with fantastical tales of adventure. The message of this book is that Cornelia is important and has her own special talents and abilities which are to be equally admired and appreciated alongside her famous parent's ability. The annoying aspect of this book is the way that the author is intentionally trying to broaden her reader's vocabulary with the use of big words. I don't mind that as a general rule but if you use a word and then define it each and every time (as part of the story) it begins to grate on your nerves. Because of Blume's habit of defining vocabulary words all throughout the book I would say that the book is accurately pegged for the tween girl in your life. I can totally see how a girl between the ages of 10-13 would enjoy this story. I think it would be hard for an adult to read this book and be able to totally enjoy it because you begin to feel like she's talking down to you a bit instead of telling the story. However, in her defense, she writing with 11 year olds in mind. There you have it. It is also dated to the present day with pop culture references which is why I'm going to say that it is not a classic. Cute, a quick read, and not entirely memorable. It's not horrendous. You'll either like it a lot, find something to hate about it, or you won't care about it. Any emotion is possible. It's just one of those books that has a funny aftertaste. I think it's like the movie Second Hand Lions, but for girls. You can give it a polite nod and move on. I'm completely ambivalent about this author. I read one book by her, Tennyson, (review here) that I liked very much, and one that I hated, called The Rising Star of Rusty Nail, because I think she got the history all wrongand the characters were annoying. (Review of Rusty Nail here.) I read the Cornelia book, too, and thought like you that it was so-so. You might like Tennyson, though.